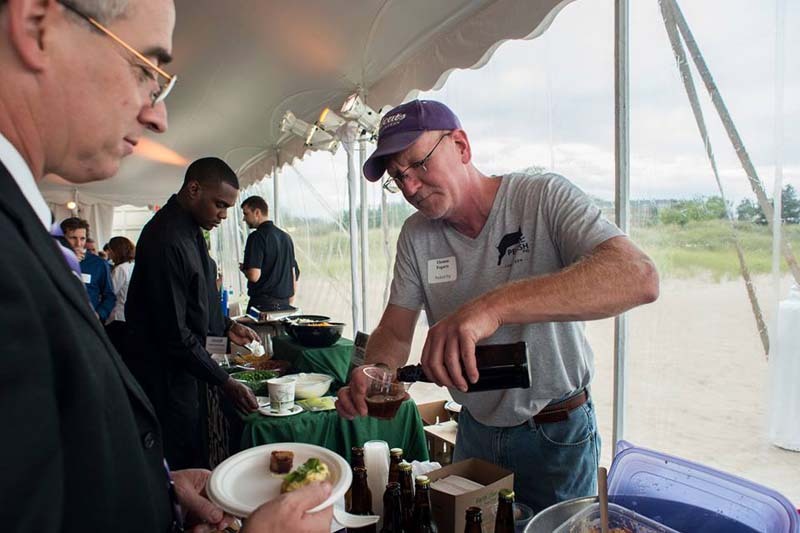 Tom Fogarty, the brewmaster of Peckish Pig, pours a sample of brown ale at Northwestern’s beachfront in a community gathering event in September. The restaurant will be the first brewpub in Evanston with a scheduled Dec. 1 opening. Evanston City Council approved a liquor license on Monday night for the city’s first brewpub, bringing it closer to a December opening. Culinary aptitude runs through the bloodlines of Jamie and Debbie Evans, who opened the Celtic Knot pub, 626 Church St., in addition to a wine shop and cafe in Chicago’s Rogers Park neighborhood. Jamie Evans said he plans to manage the brewery operations of Peckish Pig, while Debbie Evans will be a chef at the restaurant. Prior to living in Evanston for 16 years, the couple lived in Japan, where Debbie Evans taught European cooking. The construction of the brewpub has been a family effort involving the Evans’ son and daughter. Debbie Evans said her father helped build the Celtic Knot pub after she became a co-owner of the store in 2005. Debbie and Jamie Evans have since sold the building. Peckish Pig, their latest restaurant on the Evanston side of Howard Street, is aimed at catering to residents in what the couple described as an “underserved” part of the city. The pair leased-to-own the five storefronts located at 623-627 ½ Howard St. after the city purchased the property through tax increment financing funds. With the support of Ald. Ann Rainey (8th), the couple has combined the stores to create a 6,000-square-foot floor plan, about half of which is designated for an outdoor patio. During the summertime, the restaurant will host live music, Debbie said. Peckish Pig will neighbor Ward Eight, a wine bar that opened last November with the help of tax increment financing funds. Debbie said she is hoping to develop a “symbiotic” relationship with Ward Eight, 629 Howard St.
“If you provide really good people, good food and good drinks, that’s success in itself,” Debbie said.